It’s one of those smartphone-era technology breakthroughs that you’re constantly hearing will happen very soon: an “indoor GPS” system for retailers, allowing shopkeepers to send their would-be customers digital coupons and other goodies tailored to the place they’re standing in the store. Brick-and-mortar retailers would probably like to start using these systems if they could increase sales and slow down the practice of “showrooming,” where shoppers check out the physical goods and then go home to get a better deal on Amazon. Up-and-coming technology providers are betting their companies on the idea, hoping to be the big winners that provide everything from the location-tracking systems to the back-end software to the smartphone apps that consumers will use. But it’s never truly arrived. That started to change in early December, when Apple began using its new Bluetooth-based iBeacon system to automatically light up the screens of shoppers who entered its retail stores. Three days after the Apple store iBeacons went live, chip-manufacturing giant Qualcomm announced it was selling a new line of location beacons that also use a low-power version of Bluetooth. In mid-January, clothing retailer American Eagle announced an expanded 100-store trial of indoor tracking technology with shopping-app startup Shopkick. Two weeks after that, Major League Baseball added that it would start using the technology to connect with smartphone-toting fans at 20 ballparks this spring. In Boston, this surge of interest was good news for a company called Swirl. 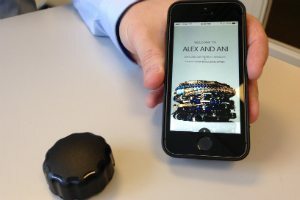 The venture-funded startup has developed a software system that connects to small Bluetooth Low-Energy beacons installed in stores, giving retailers the ability to create an application and tailor discounts and other offers to people based on where they are in the aisles. Can’t decide whether you want to get that second pair of pants? The store owner can see you’ve been lingering at the racks for a while, and offer to knock the price down in order to close the sale. One of the retailers taking the leap is Alex and Ani, a Rhode Island-based jewelry retailer that tested the Swirl system of software and battery-powered beacons last year. As of today, the company is officially expanding that to more than 40 stores nationwide. Ozguc expects to announce deals with other well-known retailers in the future. “It’s the year of the beacon,” he says. And while Apple has helped ignite competition around the business world, Ozguc says Swirl’s smartphone beacon trials have shown the kind of results that retailers are looking for. The startup tested its service with Alex and Ani, Kenneth Cole, Timberland, and other retailers over a two-month period last summer in New York and Boston, capturing uses by thousands of shoppers. Swirl says more than 75 percent of shoppers who got push notifications from the beacon system opened the app while they were browsing the aisles, and about half bought something with a digital coupon from their app while in the store. It’s a relatively small sample, but those are far better use rates than something like a typical blast e-mail. Swirl, which landed a new $8 million financing round in October led by Hearst Ventures, makes its entire system, including the small, battery-powered beacons (they’re flat and round, roughly the size of a knob on your household oven). They can work with Apple’s iBeacon communication protocol, which is more open, or Swirl’s encrypted SecureCast communication system. One big question still looming over the apparent march of in-store location tracking is whether consumers actually want to be followed by the stores they’re visiting, a concern that could seriously hamper adoption by the very shoppers the whole industry wants to attract. Politicians have been paying attention to those privacy worries, with U.S. Sen. Al Franken pointedly questioning a Palo Alto, CA-based company called Euclid over its in-store location data service based on Wi-Fi signals. Ozguc says consumers definitely need to know they’re getting a better deal by letting a store follow them around the aisles before they’ll adopt this new system. But he also points out that the Swirl apps require consumers to approve their participation beforehand, unlike the opt-out system that drew Franken’s attention. “Opt-in works. I don’t know why more people don’t do it,” he says. Contextual computing with iBeacon devices will changes how people engage with the world around them. OfferDrop is another marketing platform for marketers and local merchants to deliver in-store mobile customer engagement.